Click for more details about Beaming Baby Bio-Degradable Diapers Newborn Mini (Size 1) Case of 8 (160 diapers) Bulk Buy Savings! OVER 77% BIO-DEGRADABLE, (including the packaging) that's 53% more bio-degradable than standard disposable diapers and 33% more bio-degradable than eco-disposable diapers; this is the Most Bio-Degradable Disposable Nappy in the US. Great customer service, really friendly. Amazing diapers, only ones that don't give my baby any rash and don't leak like other eco brands. Great Product, impressive customer service. Bio-degradable Diapers should be the industry standard... and I'd recommend Beaming Baby. We plan on trying cloth ones once we recover from our C-section birth, until then, these are ideal. Thank you. Never leaked, never caused a rash. Re-ordered!!! We love them. Great value for money. Would highly recommend. No diaper rash at all. perfect fit, diaper rash free, no leaks and very green- love them! 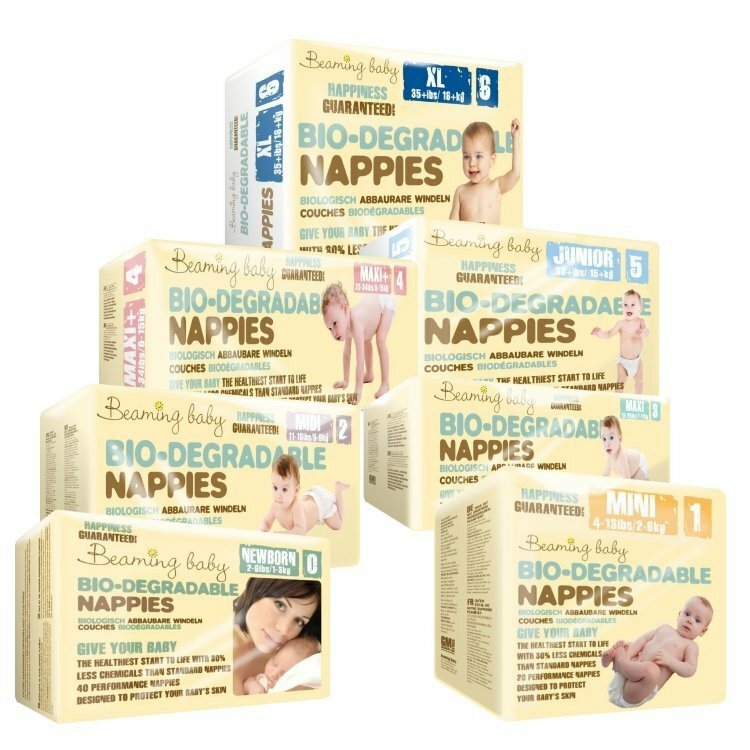 Brilliant diapers, id used naty with my 2 older boys and they were great, but just had my 3rd and wanted to use biodegradable diapers again, but naty, perhaps its just the newborn ones which are flawed, but every single diaper leaked, same place every time, around waist on left?? Possibly to do with the lack of elasticity around waist and the left tab always seems to be caught and pressed into the front of the diaper, you'd have to rip the diaper to get the tab out and subsequently fasten the diaper properly. Very sad as id always sworn by naty, loved the fact my boys never got diaper rash with them. Anyway, glad to say beaming baby are a great fit and don't leak. No diaper rash, skin always dry and the diapers hold a lot. The only thing that would make them perfect is if the price could come down ever so slightly but I'm willing to pay for such a great product which is as green as this! ?? Great product. Absorbent, no diaper rash, and easy to use. The best diapers I have tried so far ! The diapers are very good. We have had very little leakage and no diaper rash so far. Started using Naty diapers for my newborn but was getting awful leakage right up the back. Switched to Beaming Baby and haven't had a single problem. Also the tabs seem to be more sticky meaning that I have been able to fold the front down (without it popping open) to accommodate his cord stump. These diapers work just like the highly-priced ones from the supermarket (e.g. : Pampers), but are many miles ahead of them with respect both to my baby's skin health and our planet's, and will cost no more than those! My baby always has dry skin and no diaper rash to date! Excellent service. Diapers are brilliant, they smell much nicer than other diapers and don't leak explosive poos! We tried these because of her diaper rash. Excellent value for money and we like the convenience alongside the environmental aspect. Diaper rash improved and then sadly returned. Beautiful diapers with quality materials. keep up the good work! Very happy baby and mummy with diaper quality. We using since day one. She is over 2 months now and we didn't have any issues with diapers or baby skin. Best diapers so far ! After my newborn had 2 bouts of diaper rash in the first 3 weeks of his little life we decided to try these out. He has been rash free ever since and is perfectly comfy 4 weeks later, so now we're moving up to the next size with confidence. Definitely worth the money! Despite the cost, these are the best diapers we've used. Not only do they contain any poomageddons, but they leave baby soft bottom skin in good condition. No signs of any diaper rash or broken skin! Love them. We've been using these diapers with our little girl for the last few weeks and found them to be great. In fact, when we ran out and had to use an eco brand available in supermarkets, while we waited for the next delivery, my husband remarked how much better the Beaming baby diapers were. This is the BEST diaper on the market because it has never leaked even after 12 hours a night, my little one sleeps throught the night since she was 3 months and 2 weeks old. I have read that the diaper has won and award and I would like to Congratulate it because it truly deserves it! I have been using your diapers since my son was born 4 weeks ago and they are fantastic! I have never had a leak and have not had to use any diaper rash creams. I also using the sensitive wipes and both are so gentle on his skin, I wouldn't use anything else. You're reviewing: Beaming Baby Bio-Degradable Diapers Newborn Mini (Size 1) Case of 8 (160 diapers) Bulk Buy Savings!